Today I saw The Descendants with Dr. Write, the second time I've seen it (the first viewing was with the Historian). I thought it was every bit as good the second time, and that got me thinking about how many movies I see more than once, and why, and also what movies I deliberately seek out to re-view. And why. This may be a reflective post, so hang on. My movie-going partners are a somewhat fractured bunch. I like, as readers of this blog well know, to see at least two movies a week--I feel robbed of something essential in my life if I don't. "I want to see all the movies," I declared to the historian while he was reading the paper, sometime during Christmas break. But the fact is, I don't want to subject him to some of the movies I want to see, or would enjoy seeing, or frankly would feel more complete if I had seen. He doesn't enjoy superhero movies or most action movies or sci fi or fantasy. I used to see movies with my kids quite a bit, but they've scattered. I typically see kid-oriented movies with them and the grandkids, with an occasional other movie thrown in for good measure. Sometimes that's a re-view. And finally, I see movies, here and there, with friends--trashy dance movies or romantic comedies or (sometimes) vulgar comedies. In those overlapping areas, that's where a lot of the re-viewing happens. Bridesmaids--once with the historian, once with my oldest darling friend, once with a new friend (at Brewvies--actually, "at Brewvies" is a tag that often goes with re-viewing). The Girl with the Dragon Tattoo--once with the historian, once with that same new friend (at Brewvies). Crazy, Stupid, Love--once with the historian, once with my daughter. Midnight in Paris--once with my oldest darling friend, once with the historian and friends. Morning Glory--once with the historian, once with my daughter. Horrible Bosses--funny both times, once with the historian, once with...? The Guard--both times with the historian, that's how much we liked it. Our Idiot Brother--once with the historian, once with friends, though I can't remember exactly which viewing came first. Sherlock Holmes: Game of Shadows--once with historian, once with kids. We Bought a Zoo--once with daughter, once with historian. from when I was a child: The Sound of Music and Mary Poppins--in fact, I had a great big Julie Andrews thing, i.e. crush. I adored Cabaret when I was in high school, a love which carried over into forever. I have the soundtrack on LP. I also loved Annie Hall and A Touch of Class (George Segal and Glenda Jackson). I re-watched The Last Waltz in a theater on University Avenue, showing upon showing, in downtown Provo. With my children and nieces and nephews and brothers and sisters I have watched What About Bob?, Groundhog Day, Raising Arizona, and Home Alone more times than I can mention. I went back to the theater by myself to see Mrs. Soffel (tragic Diane Keaton and Mel Gibson, directed by Gillian Armstrong omg the humanity!) and Jerry Maguire, yes, I admit it. The historian and I will stop what we are doing and watch for minutes or, you know, the rest of the movie, when The Station Agent, A Few Good Men, and You've Got Mail (which--underappreciated!--has killer little Dave Chappelle segments that are entirely worth showing up for) come on cable. There are times when I would rather go back to the theater to watch a movie a second time than see something new, even if it's worthy. The other night, we re-viewed a movie from the 90s that Bill Murray directed, Quick Change. My kids had watched it the previous evening, and one of them remembered that I'd loved it all those many years ago. So we pulled it up and watched it. It wasn't great, really, but the parts that were very funny from back then were still funny now, and it gave me great pleasure to see them again. You forgot Addam's Family Values. a Classic. but the rest of the child/sibling/niece/nephew movie list i agree with. Loved this post. One of my favorite memories is watching MY DINNER WITH ANDRE at your home for your birthday. There are two movie re-views I do: GHOSTBUSTERS at Halloween and O, BROTHER on Christmas night. I never tire of them. Meanwhile, I'm glad you like THE DESCENDANTS, too. I feel validated. 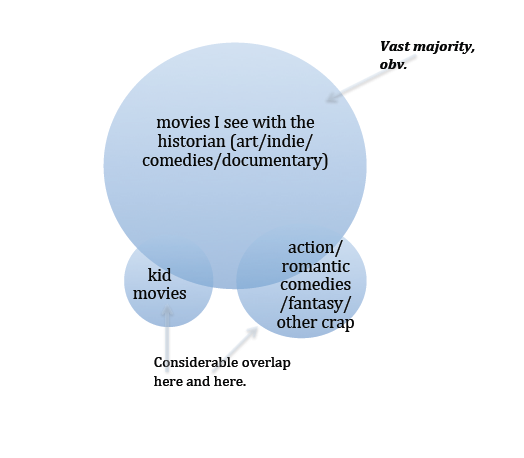 Just the description of your movie-going habits exhausts me--and makes me kind of envious. I was recently trolling through tv channels, stopped "briefly" on Shawshank Redemption during the opera record scene and, before I knew it, Morgan and Tim were hugging on the beach and I may or may not have been teary. Didn't care for The Descendants, however, but I accept this as a personal flaw. MY DINNER WITH ANDRE! It cheers me immensely to hear that somewhere in the world someone else has seen and loved this movie. Love your list -- though the idea of watching GROUNDHOG DAY over and over does seem kind of like the Redundant Department of Redundancy? I think I shall take your re-view list as a list of movies to view the first time. Why am I always so behind? If I lived in Salt Lake, would you make sure I wasn't so deficient in this movie viewing department? I think Radagast and I are similar. Oh, there's Shawshank. I suppose I should watch that for the 100,000,000th time. Because it's already there and the TV is already on. What should we rewatch while you are here? I'm sure we will think of something.